Diageo and Thin Film Electronics ASA, a global leader in the development of printed electronics and smart systems, are looking to completely change the role of a bottle in the consumer experience with a prototype Johnnie Walker Blue Label ‘smart bottle’ that is being unveiled at the Mobile World Congress this week in Barcelona. The connected smart bottle aims to enhance the consumer experience by using printed sensor tags featuring Thinfilm’s OpenSense technology, which can detect both the sealed and opened state of each bottle. The tags and the sensor information they contain will allow Diageo to send personalised communications to consumers who read the tags with their smartphones. The innovation, created by Thinfilm in collaboration with Diageo Technology Ventures, will make it possible to send consumers targeted and timely marketing messages, whether at retail or after purchase, such as promotional offers, cocktail recipes and exclusive content. Thinfilm’s proprietary OpenSense technology makes use of smartphones’ near field communication (NFC) capabilities. The technology allows Diageo to track bottle movements across the supply chain, in-store and to the point of consumption, with the sensor tags remaining readable even when the factory seal has been broken, providing an additional layer of security in protecting the authenticity of the product. Unlike conventional static QR codes that are often difficult to read, easy to copy, and do not support sensor integration, OpenSense tags can dynamically detect if a bottle is sealed or open with the simple tap of an NFC smartphone. To ensure authenticity, the tags are also completely and permanently encoded at the point of manufacture and cannot be copied or electrically modified. Helen Michels, global innovation director, futures team at Diageo, says: “Mobile technology is changing the way we live, and as a consumer brands company we want to embrace its power to deliver amazing new consumer experiences in the future. Davor Sutija, Thinfilm Chief Executive Officer, adds: “As mobility becomes ubiquitous, consumers want and expect brands to follow suit and deliver custom mobile experiences. But today’s conventional NFC mobile marketing solutions are not technologically advanced enough to create immersive or customisable consumer experiences. The prototype bottle will be on display at Thinfilm’s booth at Mobile World Congress in Barcelona, Spain throughout the four-day event. Diageo Technology Ventures was established in September 2014, and is a program specifically designed to solve some of the company’s existing business challenges and unlock new opportunities for future growth by working with emerging technology companies. 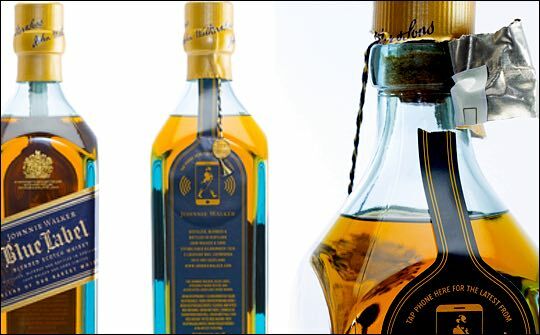 As the first initiative to be rolled out as part of this program, the working prototype bottle illustrates the new possibilities Diageo’s packaging enables for customers and retailers including advancements in sensors, electronic printing, material sciences and mobile technologies.